The City of Detroit is bust. Selling off its exceptional hoard of art treasures could fix it – but not without complicated and legal consequences. Ivan Lindsay, The Good Life/ Art, Spears WMS Magazine, Issue No. 35, December 2013. ON 18 JULY, Detroit filed for Chapter 9 bankruptcy, seeking protection from its creditors. The city appointed Kevyn Orr as the emergency manager to oversee dispersal of the city’s assets in order to satisfy an estimated $18.2 billion debt, or $27,000 for each resident. Key assets being assessed and valued by Orr include the Coleman A Young Airport, publicly owned land such as Belle Isle (a 982-acre island on the Detroit river), the Detroit-Windsor Tunnel and, most controversially, the 60,000 artworks belonging to the Detroit Institute of Arts, one of America’s top ten art museums. Detroit’s crisis has been brewing for decades and the bankruptcy came as no surprise to the city’s residents. In the first half of the 20th century, the city was rich and home to 1.8 million people. Today only 700,000 remain and many are poor and have had limited education. Detroit’s big three carmakers — Ford, General Motors and Chrysler — failed to keep up with foreign competition (and had to be bailed out in 2009), and the city’s leaders ran up huge debts and struggled with corruption. A New York Times article described the city as suffering from ‘municipal mismanagement, race riots, white flight, black flight, dead flight (people routinely disinter their deceased and relocate them to the suburbs)’. 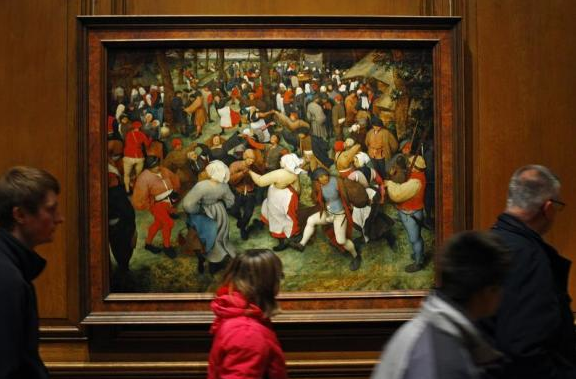 Amid this chaos sits the Detroit Institute of Art (DIA), one of the leading museums in America, with masterpieces by Pieter Brueghel the Elder, Vincent van Gogh, Tintoretto, Rembrandt, Frederic Church, Jan van Eyck, Henri Matisse and Mark Rothko. The legal situation is complicated in that the artwork is held in trust by the museum on behalf of the city. Bill Schuette, the Michigan attorney general, has stated that the art is held in public trust and cannot legally be sold. However, bankruptcy lawyers have said that if this were true then Detroit would not have successfully deaccessioned parts of its collection over the years with the purpose of raising funds to buy more artworks. Bill Nowling, Orr’s spokesperson, said: ‘Christie’s want to come to the table with alternatives that generate income, substantial revenue, without changing the ownership of the art.’ Presumably this would involve leasing the art to museums in the Gulf region, which have similar arrangements in place with the Louvre and the Guggenheim, or perhaps China, which is full of empty museums. Orr, who admits he has never visited the museum but says he knows some of the artworks from an art course he took, is keeping his options open, saying a sale is a possibility but he won’t make any decision until he receives the valuation. He is being careful with his comments, saying: ‘Every time I say something about the DIA it’s another three weeks of “Orr the Luddite is getting ready to sell the family jewels”.’ He maintains that the DIA can only display 5,000 of its works at any one time and there are at least 35,000 that are not subject to bequests and other obligations and could therefore be sold. The DIA has retained a top New York bankruptcy lawyer and has indicated it will fight if forced to sell. The operating costs of the museum are mostly being met by the neighbouring Oakland, Wayne and Macomb counties, which are contributing $23 million per annum. These counties have put the DIA on notice that if it is forced to sell any artwork they will cancel these funds, which would probably force the DIA to close. Christie’s valuation is making the DIA nervous, as the values are likely to be far higher than the estimated $2.5 billion widely quoted in the press. The top ten to fifteen works alone could be worth $1 billion (see below right). A more likely valuation for the collection is more than $10 billion, perhaps considerably more, making a sale a genuine solution to the debts. Normally museums like to keep valuations vague, and insurers and federal law allow them this. Currently the DIA has a blanket insurance policy for which it pays a modest $112,500 premium per annum. That is likely to change if the valuation comes in much higher, with repercussions for all museum insurance. Detroit’s predicament is being watched by other US cities that have serious financial problems. The long-term problem of closing the $2.7 trillion pension gap in the US will be affected by the legal precedents set here. That a major US city should be contemplating the sale of its art to pay off debts and meet pension and operating obligations would have been unthinkable a decade ago. But art always follows the money, and America’s national patrimony is now vulnerable as world power shifts east. The journalists, art historians and museum curators who are howling in protest at the possible sale seem to think Detroit has more right to this art than anyone else. It doesn’t. It can no longer support its city services and pensions, let alone a museum of this calibre. However, art is eternal — ars longa, vita brevis — and owners of art, whether private or public, would do well to remember that art never really has a true owner, just a custodian at any moment in time. The new museums in the world’s thriving economies, such as oil-rich Qatar, must be getting excited and will be discreetly poring over the Christie’s valuation as soon as they can obtain a copy. A Qatar bid for the masterpieces would be the deal of the decade. Whether the sale of the artworks is a sideshow — a bargaining chip to underscore the severity of the situation and encourage state or federal help — or a genuine possibility, only time will tell.